You want to add 12 additional SSDs to an existing Starter X-Brick (10TB with only 5TB installed) in your environment (less than 12 is not supported, however it is technically possible). Valid support contract with Dell-EMC, you will need to access documentation that requires a valid login to Dell-EMC support. X-Brick is fully functional and connected to an XMS. Have a copy of the default passwords for XtremIO, I cannot list them here due to the Dell-EMC partner agreement. The accounts you will be using are: tech and xmsadmin. You have to access Dell-EMC support and search for Article number “332100”. 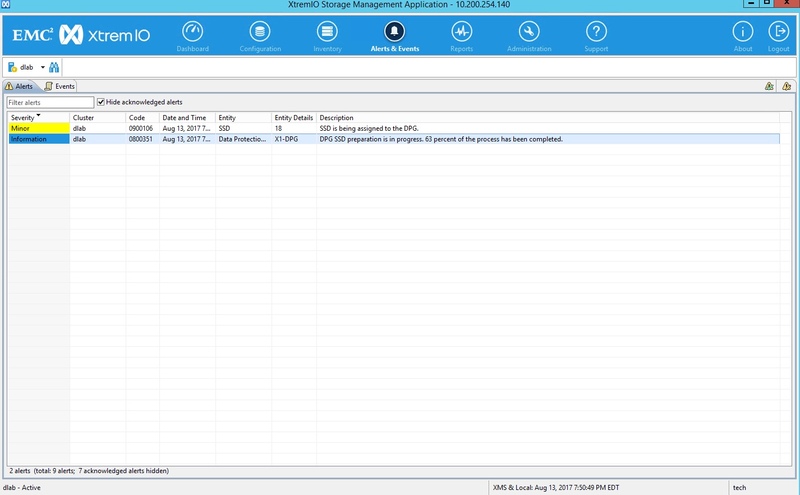 Have access to the XtremIO Management System (XMS). The “EMC XtremIO Storage Array Software Installation and Upgrade Guide”, “Chapter 9, Expanding a 10TB Starter X-Brick (5TB)” from Dell-EMC supportcovers this in detail. This procedure does cover the mechanism from the UI and SSH. I had problems with the UI method and was forced to use the SSH procedure. Open the rack that houses the X-Brick you want to add storage to. Remove the 12 plastic SSD fillers from slots 13 to 24. Install the 12 SSD drives into slots 13 to 24. 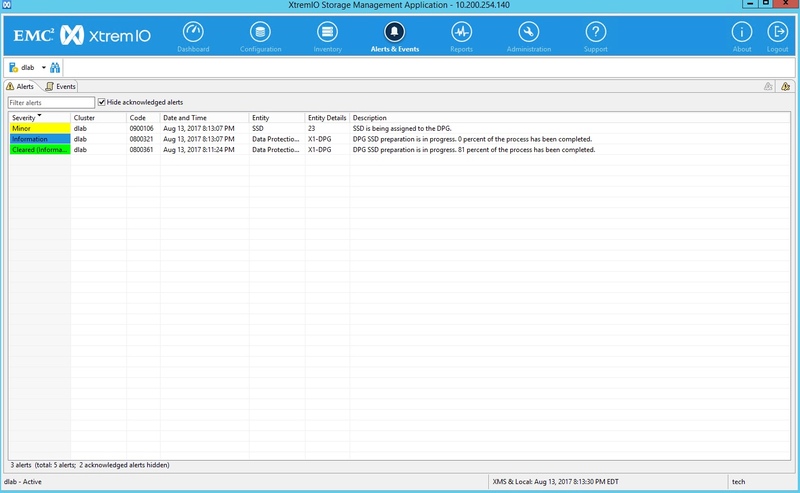 The XMS UI will be used to track the SSD drives being brought online via the Alerts & Events screen. The SSH session in Step 3 will be used to issue the commands to bring each SSD online. It takes approximately 3 minutes per SSD. Access the XMS UI by opening a browser and entering https://<XMS IP address> from your JumpBox/Laptop. Download the Java applet and launch it. Accept any Java warnings and login as “tech” (get default password from Dell-EMC support). This is a configured XMS instance, you should see the X-Brick cluster in the UI. 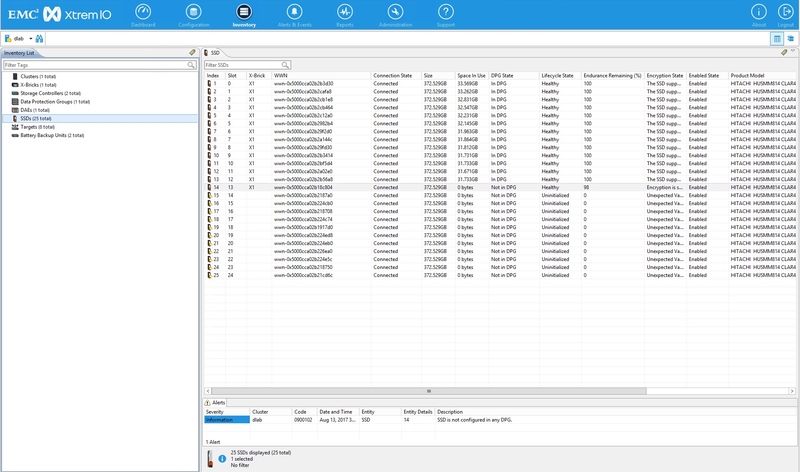 Select the Inventory pane of the UI, select the Table View and then select the SSD object. The new SSDs should have a “DPG State” of “Not in DPG” and “Lifecycle State” of “Uninitialized”. The existing SSDs will be “In DPG” and “Healthy” respectively. Make a note of the X-Brick ID, the DPG ID and the DPG “Useful SSD Space”and “User Space”. Keep the XMS UI open with the Alerts & Events window selected. This is how the status of each SSD addition will be tracked. Open Putty and SSH to the XMS IP address and login with “xmsadmin” and then with username “tech” (get default password from Dell-EMC support). Use the command “show-ssds” to get the SSD list of the X-Brick, including the WWN identifiers. The WWN identifier for each slot will be used in the following steps. Starting from Slot 13, sequentially execute the following commands. Use the X-Brick, DPG and WWN IDs recorded earlier. Use the command “add-ssd brick-id=”<X-Brick ID>” ssd-uid=”<SSD-WWN>” is-foreign-xtremapp-ssd” to initialize the SSD in the X-Brick. My use-case had SSDs from another X-Brick, so I had to force the command by using the “is-foreign-xtremapp-ssd” flag. Use the command “assign-ssd dpg-id=”<DPG ID>” ssd-uid=”<SSD-WWN>””to add the SSD to the Data Protection Group (DPG). Check the XMS Alerts and Events UI to track the percentage of completion for this task. As each event has completes (it will turn Green with a “Cleared” state), proceed to the next slot, until Slot 24 is reached and completed. Select the Inventory pane of the XMS UI, select the Table View and then select the SSD object. All 25 SSDs should have a “DPG State” of “In DPG” and a “Lifecycle State” of “Healthy”. Then select the Data Protection Groups object and verify the DPG “Useful SSD Space” and “User Space” have doubled. The XMS Dashboard will also show a doubling of Physical Capacity. Your XtremIO X-Brick solution is now ready to provide additional storage services: EMC XtremIO – Provisioning a LUN. Next Article Make your ElasticSearch Fly!